A Pueblo Indian legend comes to life in Sarah Janece Garcia's magnificent painted menagerie. A flock of jewel-toned hummingbirds beautifully capture a Pueblo Indian legend passed down through the generations. This joyous painting is part of Sarah Janece Garcia's suite of hummingbird paintings. The tale tells of how the brilliant hummingbird gained its plumage through an act of bravery. According to legend, the tiny bird flew to the rescue when Pueblo land was threatened by fire. It flew to the north, south, east, and west to gather rain clouds to extinguish the flames. During its heroic flight, the hummingbird shot through a rainbow, and it is believed that this is where it got its majestic colors. 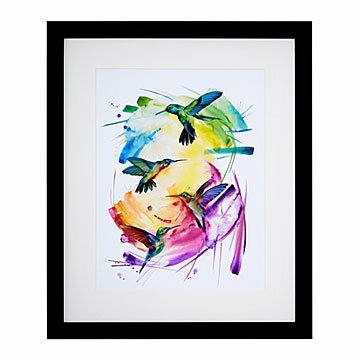 Sure to add a flight of fancy to any wall it adorns, Sacred Sun celebrates this aviary hero through bold brushwork and splashes of color. Made in Dallas, Texas. Printed and framed in Portland, Oregon. Click here to see the companion piece First Light. I was very pleased with the print. The quality was great and the picture beautiful. My sister loved it and it was the perfect gift for her birthday. My only suggestion is to not glue the mat to the print to allow for a different mat (colored) . We both love birds and bright colors. This print is perfect. It has beautiful simplicity to it and the colors are so vibrant. The print is gorgeous and so much better in person. My girlfriend loves it!